Did you know that water makes up about two thirds of who we are? Did you also know that drinking water also assists with some bodily functions, such as regulating body temperature, helping with brain function, maximizing physical performance, fighting illnesses, and boosting energy? As you can see, water is extremely important in our daily lives, specially for children’s development! Unfortunately, some studies indicate that nearly 10 percent of people don’t even drink water at all. Most individuals prefer sugary drinks and feel as though water is too boring. How do we as a society go about teaching more individuals about the importance of drinking more water and less sugary drinks? This is where the California Healthy-By-Default Kids’ Meal Drinks Bill (SB 1192) comes into play. This Public Health Advocates (PHA), American Heart Association, Latino Coalition for a Healthy California, California State Alliance of YMCAs and MomsRising joint initiative believes that if we all work together, we can make a difference through this particular bill. The main objective of this initiative is to make a healthy beverage, the default beverage for children’s combo meals instead of sugary drinks. 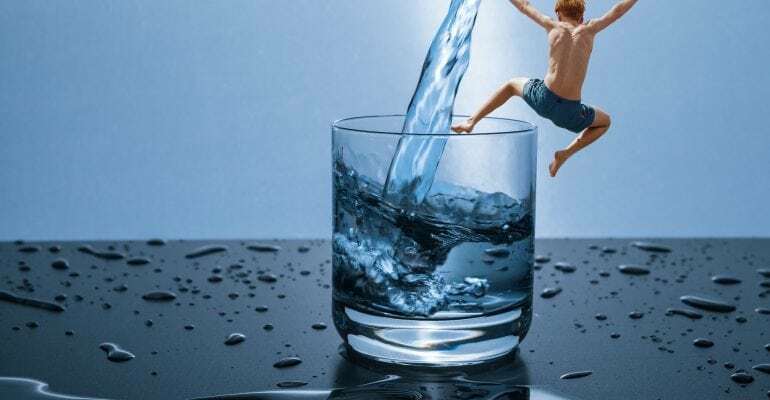 It requires a restaurant, which serves a meal primarily targeted and marketed to children, to make the default drink option served in those bundled meals a healthy beverage – water, sparkling water, flavored water with no added sweeteners, or milk. 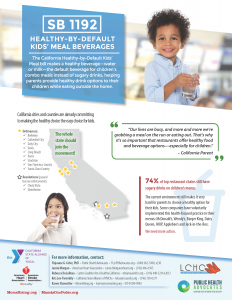 The “healthy-by-default” beverage makes it easier for parents to start the meal off right and gives California an opportunity to engage restaurants, community groups and the public, about the importance of offering healthy beverage options to young children. If the bill becomes law, cashiers would ask customers ordering a children’s meal if they want water, milk or a non-dairy substitute like almond milk. California would become the first state in the nation with such a requirement. 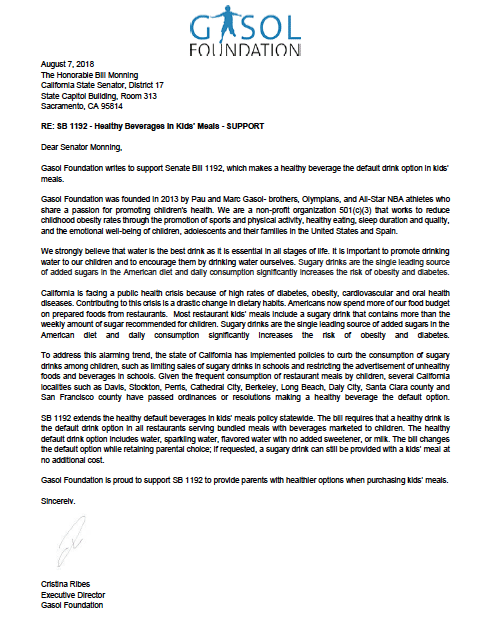 Gasol Foundation is proud to support SB 1192 in order to provide parents with healthier options when purchasing kids’ meals. Supporting proposals such as these makes our mission of reducing Childhood Obesity rates, more obtainable. We will continue to focus all of our time, energy and resources on promoting and transmitting healthy lifestyles amongst today’s youth through our programs, activities, and initiatives. You can make a difference as well! Share with others the significance of proposals such as these. Show your support for this bill on social media by using the hashtags #SB1192 #KidsMealDrinks and #HealthyByDefault. You can also tag us @GasolFoundation on Twitter, Facebook, Instagram or Linkedin. Keep your eyes wide open, as we will be sharing tips on how to promote water consumption among children in our social media channels! 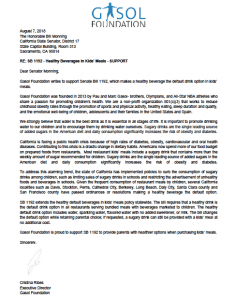 To learn even more about California’s Healthy-By-Default Kids’ Meal Drinks Bill (SB 1192), visit Public Health Advocates website. Together let’s make a difference on children’s health!